I love the Internet Identity Workshop! it is where innovative ideas are hatched, answers to hard problems are vetted and standards consensus emerges. This is just the latest in amazing collaborations that have emerged. Web Finger was covered on Tech Crunch today with this headline – Google Points At WebFinger. Your Gmail Address Could Soon Be Your ID. 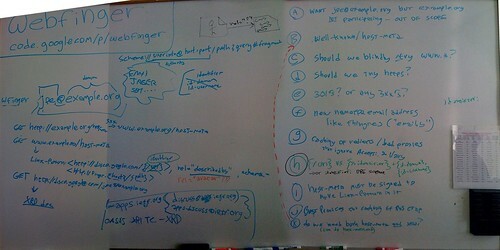 but there is a white board of their conversation and a link to what google had up. XRD the discovery protocol is part of how Web Finger works. This spun out of XRI. Techcrunch didn’t explicitly pick up on the fact that Eran Hammer-Lahev has been a key collaborator and is at Yahoo! (they did link to the mailing list where he is posting). He has been really driving XRD forward lately. I got a request for the images I posted in “Personal Anchors on the Web for Digital Identity” from David Larlet to use in a slide presentation in France. I decided to open them up and post them here. Below are versions with english text and a version without english text. WOW this is really intense. The freedom to meet and organize is FUNDAMENTAL to what it means to be a citizen in this country. This was in slashdot headlines and is quite shocking. MySpace and other social-networking sites like LiveJournal.com and Facebook are the potential targets for a proposed federal law that would effectively require most schools and libraries to render those Web sites inaccessible to minors, an age group that includes some of the category’s most ardent users. A proposed federal law would effectively require schools and libraries to render social networking sites inaccessible to minors. Law would likely affect more than just social networking sites. Blogger.com, AOL and Yahoo’s instant messaging features might be included in proposal’s definition. “When children leave the home and go to school or the public library and have access to social-networking sites, we have reason to be concerned,” Rep. Michael Fitzpatrick, a Pennsylvania Republican, told CNET News.com in an interview. Fitzpatrick and fellow Republicans, including House Speaker Dennis Hastert, on Wednesday endorsed new legislation that would cordon off access to commercial Web sites that let users create public “Web pages or profiles” and also offer a discussion board, chat room, or e-mail service. That’s a broad category that covers far more than social-networking sites such as Friendster and Google’s Orkut.com. It would also sweep in a wide range of interactive Web sites and services, including Blogger.com, AOL and Yahoo’s instant-messaging features, and Microsoft’s Xbox 360, which permits in-game chat. Fitzpatrick’s bill, called the Deleting Online Predators Act, or DOPA, is part of a new, poll-driven effort by Republicans to address topics that they view as important to suburban voters. Republican pollster John McLaughlin polled 22 suburban districts and presented his research at a retreat earlier this year. Rep. Mark Kirk, an Illinois Republican, is co-sponsoring the measure. The group, which is calling itself the “Suburban Caucus,” convened a press conference on Wednesday to announce new legislation it hopes will rally conservative supporters–and prevent the Democrats from retaking the House of Representatives during the November mid-term election. Where is the Valley's political power? I have been wondering about this for a while. Where is the companies in the Valley’s political might? and where is the political organizing amongst the people who work in this industry? In Europe the geeks organized to get the European parliament to ban software patents. It seems like it should be easy enough to organize to save the internet. I am going to do my part and organize Planetwork’s activities around One Web Day. The Net Neutrality campaign (a.k.a. Save the Internet) to keep the Internet tollgate-free and/or tier-free continues to gain momentum. What’s troubling, however, is Om Malik’s contention that many start-ups and Silicon Valley companies and fairly of the issue and why it matters. One of the Silicon Valley’s weaknesses is a lack of political savviness. Sure, many companies and executives donate money to politicians and political parties but there does not seem to be a well-organized and effective lobbying team that can be turned on in Washington when needed. Peter Chester suggests a reason for the lack of activity among the bigger players such as Yahoo, Google and Microsoft is they have relationship with carriers and cablecos that they don’t want to damage.